The entrance is the first thing one sees about your house, and as such, it sets the tone for what one can expect to see from your décor. Small wonder then that it is one of the most significant sections in the house, and most importantly, it is a zone of welcome. This week we look at a place that makes use of local craft items. 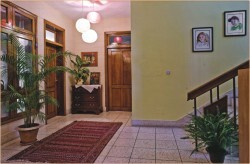 The owner of our featured house is an American lady, to whom I suggested a Bangladeshi theme. Being culturally adventurous, she agreed, and we began our search for indigenous products that would decorate her foyer. We were lucky enough to get a great space to work with. The foyer is long and rectangular, with a high ceiling, and it connects to the other rooms in the eighties-style single-unit house, ending in a staircase. The long two-part mahogany doors are topped off by stained glass, for a quaint, timeless look. The first thing I did was to place two long cane panels along the walls, next to the entry door. We had the mosaic floor re-polished to regain its gloss, and arranged green plants and lillies in traditional brass pots and vibrantly coloured clay pottery in front of the door, with a green and red satranji at the entry point. 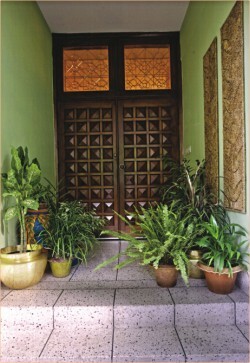 Since this door opens to the front garden, we placed plants both inside and outside the doors. We kept the area open. Even the long glass windows are see-through, so that people sitting in the living room can have a view of the welcoming space. We also provided a dry grass weave sofa and a small centre-table to create a sitting corner. We added three sleek wooden panels, arranged vertically and horizontally against the wall, with spotlights for illumination. Further lighting was provided by an ingenious rice-paper chandelier, which consisted of red, white and green globes suspended from a wooden patch in the ceiling. I suggested a warm yellow colour for the walls at the staircase, and the owner arranged portraits of her children in ascending order. Bright colours, minimal furnishings, and a local touch with the décor items together create a welcoming space that sparkles with life. The fun factor in Nokia was emphasised last Thursday night at the “Welcome to the Nokia Playground” event held at Pan Pacific Sonargaon. The ballroom was decked out in jazzy colours, flashing lights, four experience booths and the mood was set by chart-topping music blaring out at full volume. This event was to showcase Nokia's new flagship music device, the Nokia X6, as well as a new web portal connecting and engaging music lovers. “The essence of Nokia has always been about connecting people to their passion. We are all about enabling everyone to make the most of every moment,” Prem Chand, General Manager, Nokia Emerging Asia said. “There is a Bangladeshi word 'adda', am I pronouncing it right? We want to facilitate the adda,” concluded the GM, amid general amusement from the guests. The new Nokia X6 has a 16:9 wide screen optimised for photos, videos and browsing and offers easy access to social networks like Facebook and Twitter. It is capable of playing up to 35 hours of music with 16 GB onboard memory. It has a slick 3.2 finger touch interface that allows users to play games using only the touch feature. Completing the picture is a 5 mega pixel camera with Carl Zeiss lens. On the night, the Nokia X6 could be pre-ordered from one of the experience booths. The web portal http://nowplaying. nokia.com.bd, the other attraction on the night, was featured in one of the experience booths, where guests could go and sample the portal that is designed to be a playground with not only music, but also entertainment based content such as games and application from Ovi Store. Famous Bangladeshi music personalities Fuad and Feedback have partnered with Nokia, enabling music lovers to interact with them through their blogs at the portal. The night was marked by live performances by Fuad and Feedback. Fuad provided the atmospherics to old Feedback classics such as “Moushumi”, keeping the audience enthralled. Priced at Tk 30,800, the pre-order for Nokia X6 started from 19 February and will continue till 10 March. The first fifty consumers who pre-order from Nokia stores in Bashundhara City, Gulshan and Uttara will win the Nokia Bluetooth Stereo Headset BH-503. The handset will be available from March 2010.